But, sometimes you just need a little something sweet! Am I right? I don't think I would have survived the full 30 days without these little babies in my arsenal. 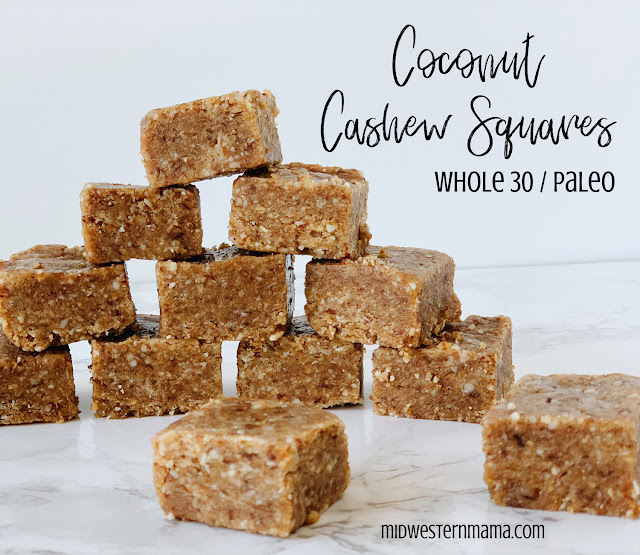 Although they are made from ingredients which are all Whole 30 compliant, just try to avoid abusing them as a dessert substitute too often! While they are made from natural sugars, it's still sugar. Ok, now I'll get off my Whole 30 soapbox and share these amazing squares with you! Add all nuts to a food processor and process until they are fine and crumbly. Add the dates and coconut, then continue to process until everything is combined. You will want to stop the processor and scrape the sides a few times to ensure all of the chunks get chopped up. Line a pan or baking dish with plastic wrap. This will help you get them out of the pan after they harden. Pour the mixture into the pan and press firmly. I used a pyrex dish that measured 7x5, and it yielded squares which were about 1" thick. Cover and refrigerate. Cut bars to desired size and store in the refrigerator in an airtight container or in the freezer. The possibilities are endless with this basic starter recipe! I love them as is, but they would also be delicious with dried cranberries, chocolate chips, dried apricots... So many options!